Despite a mum Microsoft, we're slowly learning that Windows 8 sales are, well, pretty slow. The new Windows operating system launched at the end of October, and though Microsoft claims it sold 4 million copies in the first three days of launch, the unofficial stats haven't been as rosy for the OS during its first month on the market. Our latest bit of evidence comes from web analytic company NetApplications. It said that as of Nov. 11, Windows 8 has captured 1.04 percent of the global desktop market share. That is about the same OS market share as Linux, at 1.4 percent. Apple's OS X holds a 9 percent market hold. To compare it to other Microsoft operating systems, Windows 7 has 45 percent, Windows XP 39 percent and Windows Vista take up another 5.4 percent slice. The weekly survey represents raw data, and isn't as polished or accurate as other surveys with bigger sample sizes, but it's a decent bellwether of the direction sales figures are heading. The numbers don't bode well for Windows 8 Touch either. NetApplications pegged it at 0.02 percent of the tablet space, slightly better than Windows 8 RT Touch which, statistically, has captured zero percent so far. The stats line up with consumers' attitude demonstrated by a previous survey conducted by security firm Avast. 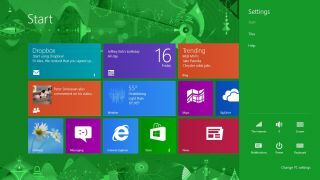 According to the survey, 70 percent said they don't plan to upgrade to Windows 8. W8's lack of traction is understandable. Most PC users aren't as in tune with Microsoft, unlike Apple users who mostly keep up with company news and jump at new products. Windows 8 for the desktop is also a bit of a departure from it's predecessor. With its fresh features such as the non-Metro Metro tile style, many users may not want to commit the brain power to learning new OS tricks and don't really see any reason to upgrade. The tablet environment is also a hard one to break into at the moment. The iPad is currently trying to hold off a torrent of Android tablets from taking over in the near future. Though Apple captured about 87 percent of the tablet market when it debuted the first iPad in 2010, its commanding lead has slipped to about 50 percent in October, according to numbers from IDG. And as Apple losses its shine, Android tablets have gobbled up most of the difference. With the two big tablet operating systems fighting for dominance and the momentum Android has built, it's hard for a new tablet OS to break onto the scene. The fact that consumers aren't really sure the difference between Windows 8 Touch and the RT version has probably intimated a few buyers as well. But Android wasn't always the mover and shaker in the tablet world as it is today, and Microsoft may learn something from the Google OS, which hovered at a single digit market share during its first two quarters after release. Android only saw sharp growth during its third quarter, and it took two and a half years for it to challenge the iPad. And Android even has a hard time getting its users to upgrade to the newest OS environment. Gingerbread is still the most popular version of Android despite its advanced 2-year age and three major upgrades (Honeycomb, Ice Cream Sandwich and the newest, Jelly Bean). The old OS is still used on about half of all Android tablets and phones. Despite the second-hand data, we won't know much for sure until Microsoft breaks its silence and releases some hard numbers. For right now, it's pretty safe to say Windows 8 isn't selling as well as Microsoft would like, but the OS isn't doing horrible for its first month. If Windows 8 flops, it will by no means ruin the company, but it might make a big dent in revenue. And it seems the new OS has a lot of uphill battling to do before conquering the desktop and mobile markets.